Baccarat or Punto Banco (meaning Player Banker) is a card game where two hands are dealt, one to the player and one to the banker. Players bet on whether the banker’s hand or player’s hand will be the closest to a total of 9 or will be a tie. There is a predefined set of rules for dealing the cards, so in essence this is not a game of skill where the player or banker can influence the outcome. The skill for the betting player is to determine which of the two hands to bet on. A lot of players use Roadmaps as a way of recording past hand outcomes so that they can spot trends and bet on those. The reality is that it’s a bit of a coin toss and there is no foolproof way of predicting the outcome of the next hand. There are also other betting options available to the player and these are available depending on where you’re playing. Check out my Live Baccarat Side bets and Game options page for further details. Baccarat is a very popular game, in fact it’s huge with Asian players and can play for very high stakes in land based casinos. 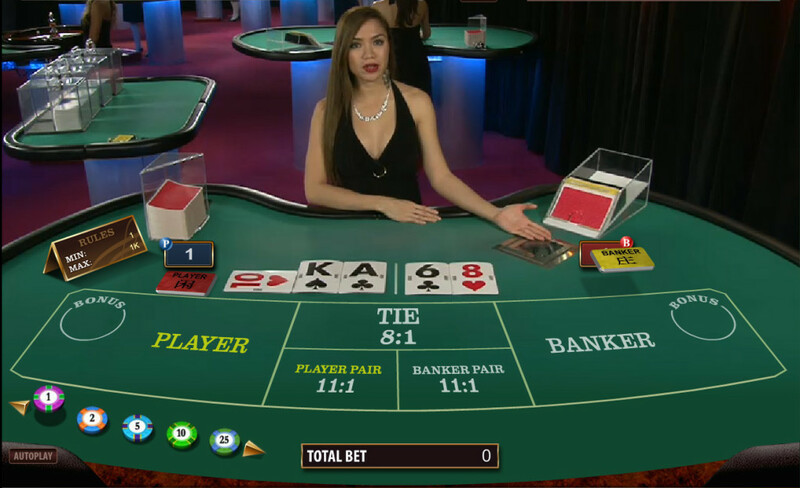 Live Baccarat offers players the option to play online but with real dealers and real cards. Whilst some of the atmosphere is lost, the game is as authentic as it’s land based counterparts. I’ll do my best to explain how to play as simply as possible. Live Baccarat is normally played with 8 desks of 52 playing cards. Two cards are dealt to each player and depending on the value of the hands an extra card may be dealt, but this is dependent on the 3rd card rule which is explained in more detail below. The hand that scores closest to 9 wins, unless both cards have the same value, which results in a tie. The maximum number of cards that can be dealt to each hand is 3. If the banker or player’s first two cards add up to an 8 or 9 (“Natural”) then no more cards are dealt and the hand is over and winning bets are settled. Depending on the value of the first two cards the player and/or banker may under certain circumstances take a 3rd card to improve their hand. A set of rules exist for determining when that happens. Hand values are calculated by adding the value of each card together. If the total value is over 9, for example 12, then value of the hand becomes the second digit i.e 2. If the two cards add up to 10 then the value is 0 and so on. As I mentioned above the game is pretty simple, pretty much a coin toss on which hand will win. But there is an array of additional information that you may find helpful. In the standard Player vs Banker game. This basically means that the house makes the best return to payouts on Tie bets, followed by Player Bets and then Banker Bets. You can draw your own conclusions from this. Serious players use “Roadmaps” to try and help them predict patterns, so that they “know” when is the best time to bet on Banker , Player or Tie. As with most card games there are an array of side bets on offer. I’ve created a dedicated side bet article to explain what they are and where you can find them. It includes Perfect Pairs, Bonus Bets, Big/Small, Progressive, Egalite and Dragon Bonus. When playing online you will come across a number of different variations of Live Baccarat. They are all essentially the same, the only difference you’ll find is the side bets being offered and the seating positions on the table. Standard Baccarat – this is a single seat game where the dealer deals one set of player cards and one set of Banker cards. There is a bet position for both hands to place your wagers. Multi-player – Essentially there are 7 betting positions, you take a seat and bet. You can see what other players are betting. Single Player – The table is set so you appear to be the only one betting. Speed Baccarat – Faster Game rounds, fastest is 27 seconds deal to deal. Mini Baccarat – Essentially the same as normal baccarat. It’s a single player game and the time allowance for placing bets is quicker than normal. Ok, now you’ve got the basics, I’ve produced a couple more articles if you’re interested in reading them. Baccarat Side bets will explain the side bets you can find and which live casinos have them. Baccarat Roadmaps gives a detailed explanation about how these are constructed and what use you can make of them. Finally, I have produced a summary page of the live casinos that I consider to be the Best Live Baccarat casinos.